In the majority of cases, pipe bursting / trenchless sewer repair is the preferred approach to resolving problems with the structural integrity of residential sewer pipes. Cracked, broken, or otherwise failing sewer lines are a surprisingly common occurrence, usually resulting from years of gradual damage that spiral out of control. Pipe corrosion and tree root incursion can quietly devastate the pipes, unbeknownst to the homeowners until they start noticing problems like backed-up drains, sewer smells, or moist areas in their yard from sewer leakage and start looking into sewer repair services. When there’s been serious damage to a section of pipe, a method called “pipe bursting” is the most common trenchless sewer repair solution in NJ. 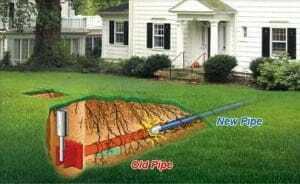 The old, damaged pipe is completely replaced, which distinguishes pipe bursting from pipe lining. Pipe bursting involves heavy equipment, but doesn’t require any excavation. As such, it avoids the need to dig any unsightly trenches on homeowners’ properties, as well as simplifying the sewer pipe repair process for contractors. Call us today to find out more about pipe bursting service and other options for sewer replacement by trenchless sewer repair in New Jersey, call us at A1 Trenchless Sewer & Drain. Pipe bursting is designed to completely push out and eliminate severely damaged sections of sewer pipe, replacing it with a new pipe. NJ sewer contractors begin with sewer video inspection, which confirms the nature and location of the problem. A cable is then attached to a specialized piece of hydraulic or pneumatic machinery known as a bursting head. The bursting head has a conical shape, and fractures the old pipe apart completely. The back of the bursting pipe is connected to a new section of pipe. As the old pipe is destroyed and pushed away, the new pipe is pulled along behind it. Pneumatic pipe bursting. 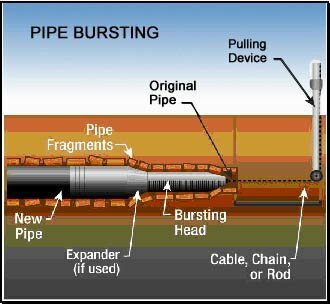 Pneumatic pipe bursting uses pulsating air to burst the old pipe by driving the bursting head forward. This creates a repetitive “hammering” effect, with a winch cable keeping the head pressed against the wall of the pipe. Hydraulic expansion. Hydraulic heads open and close as they move through the old pipe. Static pull. This type of pipe bursting doesn’t involve specialized moving parts in the head; rather, it’s simply pulled though the pipe by a segmented drill rod assembly. When is Pipe Bursting Used in NJ? Pipe bursting, unlike pipe lining, is used for trenchless sewer repair of pipes that are too damaged to simply be patched over with a liner. A typical repair job will involve replacing up to 400 meters of pipe, but pipe bursting has been completed successfully over much longer distances. In a few cases, soil which is too dense or below the water table can be an obstacle to successful pipe bursting, since significantly more force is required. Soil that’s too loose can also prove difficult, so when considering pipe bursting for sewer pipe repair, contractors will take soil qualities into account. If you’re having sewer problems, call us today at A1 Sewer & Drain. With noninvasive and highly effective trenchless sewer repair services techniques like pipe bursting, we can quickly resolve the problem for you, without damaging your yard. 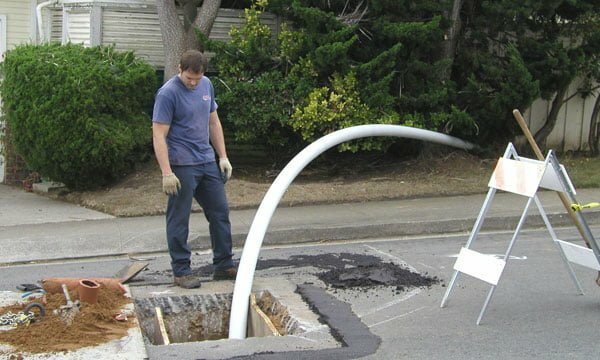 For more information, or for same-day emergency sewer repairs in NJ, call us at 201-645-0888.